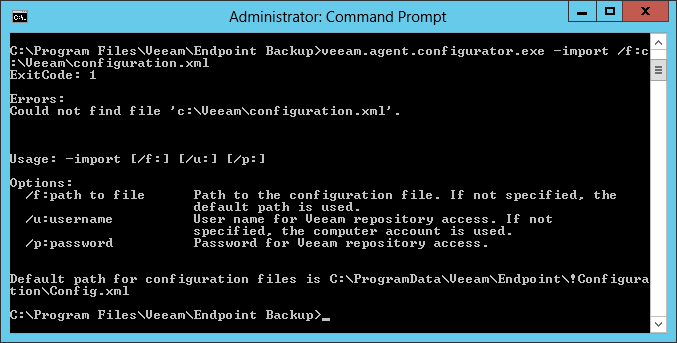 If the command executes successfully, Veeam Agent Configurator reports exit code 0 (Success). If the command fails to execute successfully, Veeam Agent Configurator reports a corresponding error code and problem description. Unexpected error has occurred during the operation execution. Operation has completed with an unexpected warning, for example, wake up timers are disabled on the computer, and Veeam Agent for Microsoft Windows has failed to wake up the computer from sleep and start the backup job. Feature is not supported by the operation, for example, an unsupported command, parameter type or value has been specified in the command input. License applied to the protected machine does not cover the requested functionality. Operation has been canceled by the user. Parameters provided for the command are invalid. Operation has not been performed, for example, Veeam Agent Configurator has failed to complete the command execution. Backup job has not been configured and operation cannot be executed. Veeam Agent Configurator has failed to generate the command output, for example, there is no free disk space, and the output XML file has not been saved. Backup job configuration has not been loaded (for example, the input XML file has not been found by the specified path). Backup job configuration contains errors (for example, specified parameters are invalid).